The Tipo designation for the Sprints is pretty simple when looking at Alfa’s designations. A need among enthusiasts to further differentiate the cars has resulted in generally accepted but not officially promoted model names such as Allegerita, Normale and Confortevole. Within these are nicknames ‘Eyebrow’ for early hand made cars with the simple grill surrounds and ‘Egg-crate’ starting at 06611 for the later machine pressed cars with cheese-grater type grills. 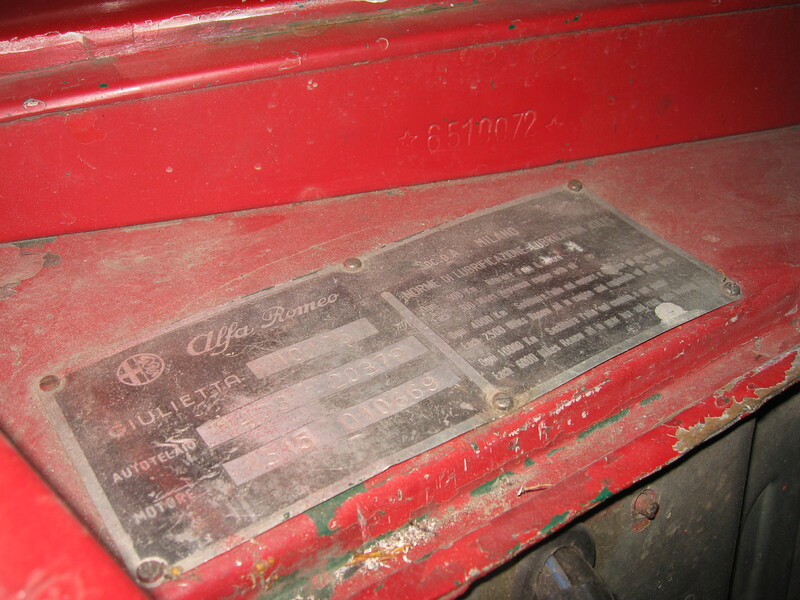 When Alfa changed specification or designation it didn’t happen immediately, new parts were slowly introduced as the old ones were used up. Cars that were made during this transition are ‘Interim’ cars, and they are individuals one car to the next due to this variation of build parts. 750B: Giulietta Sprint. Usually called ‘Normale’, considered ‘Eyebrow’ up to car number 6611, after that ‘Egg-crate’. 750E: Giulietta Sprint Veloce. Up to car 05833 these are called ‘Allegerita’ or ‘lightweight’ due to weight-saving modifications. From about 005834 to 06611 are called ‘Confortevole’. Note: all lightweights and Confortevoles are ‘eyebrow’ cars. 101.02/101.05: Giulietta Sprint ‘Normale. In 1963 101.02 became Giulietta Sprint 1300 when 101.12 came out. 101.06: Giulietta Sprint Veloce. Production officially ended in 1962. 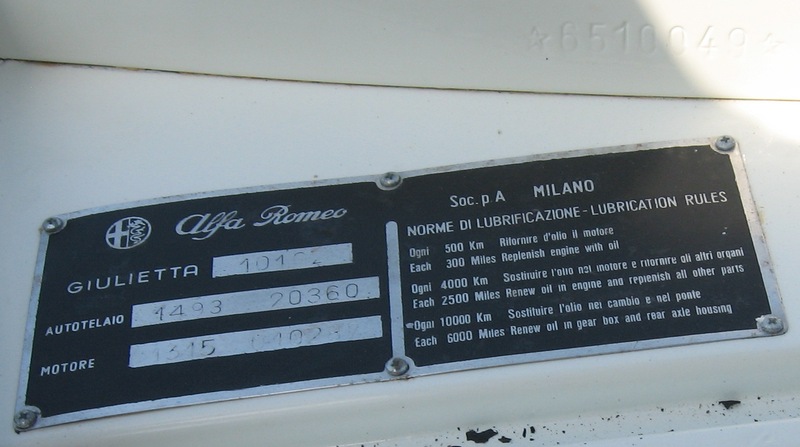 In the picture below the Autotelaio number is 1493 20329 and the engine number is 1315 010669. Sprint Autotelaio numbers run basically as noted below, but to avoid error and give just the general idea of the vin ranges I have rounded Fusi’s numbers. In many cases different Tipo’s were pulled from the same body number run as can be seen by the 750B/750E numbers, in this case 750E’s were pulled at random from numbers between 00001 – 10300, except for the narrow run of 1959 cars from 11001 – 11101, which were all 750E’s. 750B/750E: 1493 00001 – 10300. Cars run from 1954 – 1960. 750E: 1493 11001 – 11101. Cars made in 1959 only. 101.02/101.05/101.06: 1493 20001 – 26000. Cars run from 1959 – 1960. 101.02/101.05/101.06: 155001 – 164100. Cars run from 1960 – 1962. 101.12: 350001 – 351000 or 352001 – 359100. Cars run from 1962 – 1964. 101.02/101.05: 384001 – 386000. Cars run from 1963 – 1965. A couple of things to note about the numbers above. Fusi only lists 101.02 for Sprint ‘Normales’. Most of these cars are stamped 101.05 but I have seen both, so I include both. My two theories on 101.02 are that either it was used in some markets, but not the US, or that when cars are being restored, the restorer looks in Fusi and physically replicates what was initially a typo on the new blank build plate and further muddies the waters. The two cars I have pictures of with 101.02 both appear to be restored to a high standard. The Autotelaio ranges shown overlap, so car 750B 1493 09500 might be younger than 101.05 1493 20329 even though it has the earlier style designation. I have heard rumors, but seen no proof of cars that are outside of these number ranges. Last, these numbers were stamped by hand, by a person in a noisy factory and as a result, mistakes were certainly made. 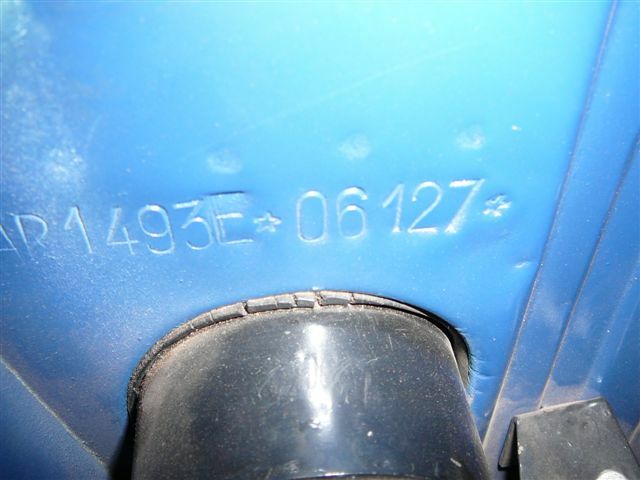 I have heard tales of two cars with the same numbers, stamped numbers that were over-struck, presumably when the incorrect number was stamped the first time. A better look at the build plate. This is what the font Bertone used looks like on nearly all of the original Sprints I’ve seen. If you are looking at a car and the font is different from this you may want to do some research, you can readily buy these build plates as blanks. Basic maintenance information is written on the right half of the plate. These screws are the correct screws for mounting the plate. A 101.02 build plate on nicely restored 1959 Sprint that also happens to be 19 cars away from mine in the Autotelaio range. 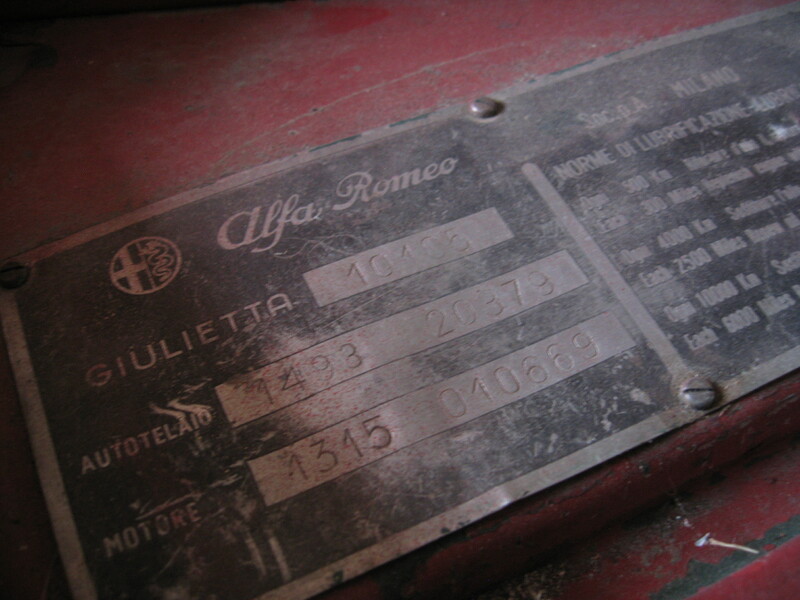 Autotelaio as stamped on the firewall of a Giulietta Sprint. The ‘E’ between the 1493 and Alfa body number means it is a Veloce. I have seen Veloce’s where the ‘E’ is not so precisely placed. What I have presented above is meant as an overview in identifying these cars. There are many more details to look at that become important when presented with a car you are thinking about buying, especially one of the rarer and more expensive Sprint variants. Next installments will be Engine numbers, Bertone build numbers and Sprint Speciale specific numbers. If you have a Sprint of any flavor and would like to help me out in my research drop me a line at sprints@giuliettas.com with as many details about the car as you care to share. I want to thank Greig Smith for the last picture. Click here to proceed to part 2 of the numbers series. Click here to check out the production and register page. This entry was posted in History, Identification Numbers and tagged cars, Classic cars, History, Italian cars by Hamilton. Bookmark the permalink.